It’s Wednesday, the third day of DEN Teacher Appreciation Week and we’re just getting started. We have another great gift for our STARs – this time from our friends at SymbalooEDU. This time around, it’s a free one year subscription to SymbalooEDU Premium. Do you know about the Symbaloo Educator Spotlight blog? 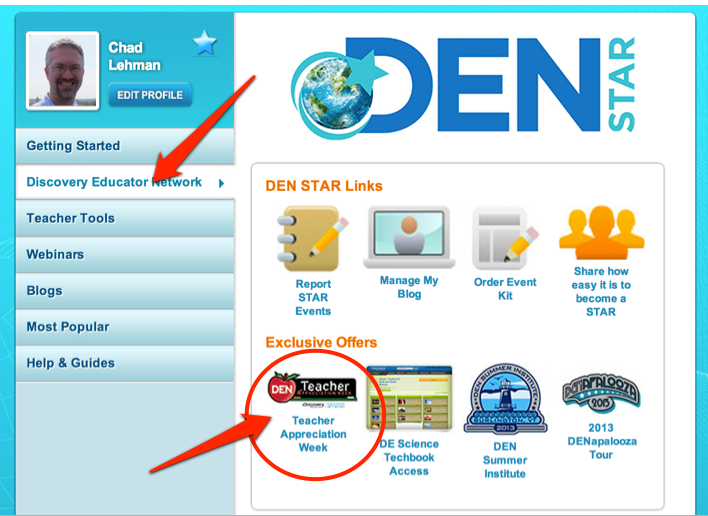 In the coming days and weeks, check it out as members of the DEN community will be featured. If you are an active Symbaloo user interested in being part of the Educator Spotlight, fill out this form and someone from Symbaloo will get in touch with you. You just might be the next featured educator. To access today’s Teacher Appreciation Week gift, log in to DiscoveryEducation.com and click on Discovery Educator Network on the left sidebar. Then, click on Teacher Appreciation Week and you’ll find the link to the SymbalooEDU offer. Head over to the site, click the orange button that says “Claim Your Free Teacher Package,” and fill out the form. At the bottom, you’ll be asked for the Promo Code that was shared in the DEN Teacher Appreciation Week – Day 3 email earlier this morning. Don’t forget to connect with the DEN in the following ways. Follow us on Twitter, Like us on Facebook, add us to a circle in Google Plus, and join us on Edmodo. I have never used this program. I played a bit with it today and this looks like a good way to keep all my digital ‘stuff’ in one spot! LOVE Symbaloo! Thank you so much! I love Symbaloo! Thank you sooo much!